Description: Banner Stands - Includes: High quality full colour print & professionally fitted to the Silver Special banner stand base, upright pole, adjusters and supplied ready to display. Inc FREE carry bag. 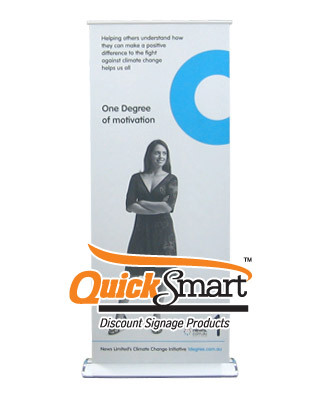 The Silver Special is a high quality retractable banner stand. The Silver Special is designed to be self-standing and does not require the use of fold out legs to stabilise. The Silver Special exhibition display stand is easy to setup, allowing you to quickly and easily deploy a series of these at trade shows and industry exhibitions. The Silver Special is a professional banner stand is ideal for exhibition displays. Great temporary signage as the banner retracts back into the base for portability. Includes free carry bag.